Franchise India 2016 was proof of how the existing brands in this sector are growing, how new players are eyeing it as a perfect growth avenue and how innovations are making this sector even more interesting. Beauty, wellness and health – the avenues that are at an all time high in India. Whether it’s about beginning your own venture or taking up a franchise, this sector is promising you immense growth in the years to come. Franchise India 2016 was proof of how the existing brands in this sector are growing, how new players are eyeing it as a perfect growth avenue, how international brands are seeing it as a perfect sector to invest in and how innovations are making this sector even more interesting. Here’s a tour of the two-day Opportunity India event and what it reflected about the trillion dollar Indian beauty and wellness industry. Troy Franklin, COO, World Franchise Associates – Southeast Asia, has been observing each industry grow closely. “Beauty, health and wellness is the fastest growing sector in franchising, both globally as well as in India,” he said during a power session on franchising at the event. The brands that have been long existent cannot agree more. While speaking to Wellness India, Dr. A Velumani, MD, Thyrocare, shared how his brand was growing and is looking at having 1,000 centres in the next few years, covering the Tier II, III, and IV cities as well. Vasudeva Vilasam, an 1884 Ayurveda brand, started off with just three products. It now has over 500 products and many spa and therapy centres, and is going to add more products and centres to its kitty through a larger distributorship as well as franchising in the years to come. Dr Pradeep Jeothi, CMD, Vasudeva Cilasam, during a session on starting up in the Beauty and Wellness sector, said, “Ayurveda is a huge industry and the scope is wide. The sector presents opportunities and scope for skincare products, hair products, health food, rejuvenation, e-commerce, yoga studios and much more.” He also told us how his brand, which was earlier popular in southern India, is now spreading pan India and is working on a huge facility in Uttarakhand. He said that the brand has also got a great response in areas like Amritsar etc. in North India. Another example of a big brand continuing its growth came from Dr Lal Path Labs. The brand recently went public with its IPO and registered huge growth with it. “IPO is just a new life that has been injected into Dr Lal Path Lab. Our brand has become more well known. My mail box is now full of people wanting to be partners or franchisees,” said OP Manchanda, CEO, Dr Lal Path Labs Ltd. The event saw a host of international brand in the beauty and wellness industry that have ventured or are venturing into the Indian market. These brands were all praise for the Indian industry even though some saw the scope of making it more organised. When we asked Stephanie Sherlock, CEO, Avention Global, Australia, to describe the Indian beauty and skin care industry in one word, she said, “historical.” She told us how her aesthetic wellness brand is looking at getting innovative solutions to the Indian market through effective partnerships with India’s big cosmetic brands. Jymka, a family fitness centre, has also received tremendous response in India. “We met Franchise India President Gaurav Marya in 2012, who saw the potential in what we were offering and getting it the Indian markets. Indian moms have an interest in the welfare of their families and I think the fitness industry has really come on here. Our programme fits the Indian market because Indians are obese and are looking for ways to become and stay fit. We’ve got a fantastic response in India. Even today there are people who are showing interest in getting our franchise,” said Anne-Marie Byrne in a candid chat with us at the event. The Sanghvi group backed MyGlamm took the concept of beauty services at home to the next level as it hit the market in 2015. The brand is now a leader in on-demand beauty services and is expanding big. Telling us about how the brand is also looking at making the beauty sector more organised, Darpan Sanghvi, CEO, My Glamm, said, “We have training centres to make sure our manpower is skilled and capable of giving out the best services.” Taking cue, Franchise India 2016 saw some really unique concepts entering the Indian beauty and wellness market. A very interesting concept we came across was that of Organic Smokes by Mea Ame Global. These organic smokes were all about cigarettes going ayurvedic. Piyush Chhabra and his two brothers spoke to us on how their own smoking habits got them into the concept of getting healthier ayurvedic smokes, looking at the growth of Ayurveda in India. We also met Sarvesh Shashi, CEO, Zorba: A Renaissance Studio, who shared with us the different innovations in Yoga his startup is bringing about. “We are trying to make Yoga cool, by getting people into practising it with a ball or a rope or a stick etc,” said Sarvesh, the youngest CEO on the block. While Zorba has about 35 studios currently, Sarvesh is looking at taking this number to a century, and even going global in the near future. 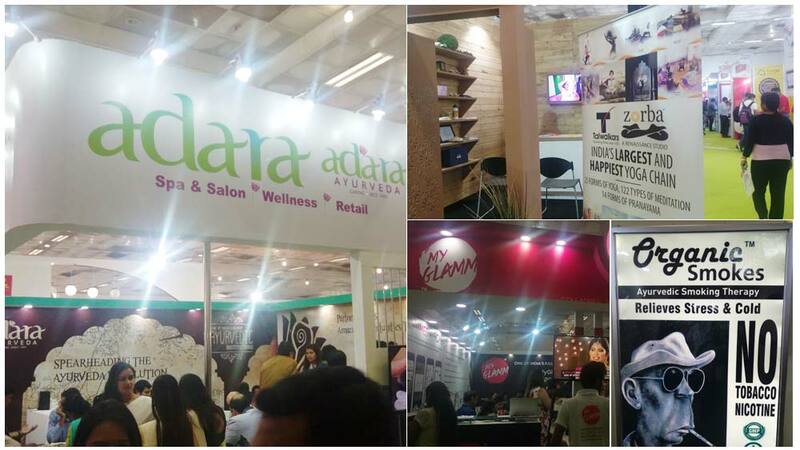 These examples and over 50 beauty and wellness brands from Franchise India 2016 present a picture that is bright. The beauty and wellness industry of India is booming and presents a Pandora box of opportunities for brands to grow as well as newer entrepreneurs to begin a journey to success. The Karva Chauth blessing for beauty biz..